Who is the Queen of Kawaii? What happens when the two quirkiest queens of pop try to out-kawaii each other? Japan found out this week when Lady Gaga appeared on the TV show Music Station (ミュージックステーション) and was sat in the same studio as Harajuku’s own Kyary Pamyu Pamyu (きゃりーぱみゅぱみゅ). Both wearing colourful outfits and pink bows in their hair, Lady Gaga looked like a manga version of herself crossed with Kyary. Various media sources have picked up on Kyary’s facial expressions whilst Gaga was in the studio – she didn’t look overly impressed with Gaga’s attempted nod to Japanese kawaii culture. It does look a bit like she’s trying to make her head explode by staring at her, doesn’t it? 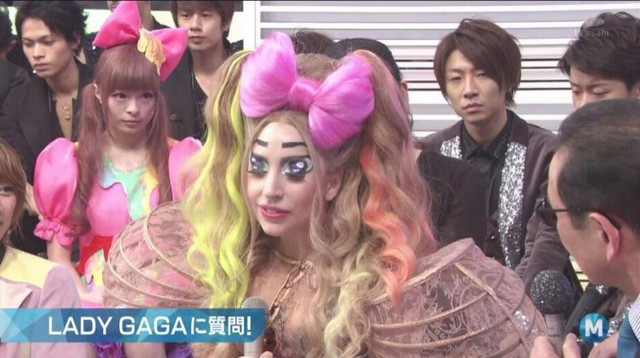 It could just be an unfortunate shot, but Kyary doesn’t look too happy with Lady Gaga’s super-kawaii style. I like both Lady Gaga and Kyary Pamyu Pamyu, and hope Gaga’s homage to kawaii hasn’t caused any problems between the two artists. Kyary is undoubtedly the queen of kawaii in Japan, but Gaga does a pretty good job of showing her love for Japanese pop culture with her fun outfit. Her eye make-up is insane – something only Gaga could pull off – and her wig is just gorgeous! I bet there are some cosplayers out there who would love to get hold of a wig like that to do a Kyary tribute of their own! What do you think – is Gaga just showing her love for Japan, or has she made a bit of a fashion faux pas? Who is the queen of kawaii? *This is the last of my NaBloPoMo posts – I’ve posted here every day in November, and what a month it’s been! If you missed any of the posts, you can find them all here under the category NaBloPoMo Nov 2013. Don’t worry though – I’m still going to be posting at least weekly throughout December! I know right? I was only looking at MatsuJun! Reblogged this on rebeccas site. Lady Gaga never ceases to amaze! Even her body language and demeanor is slightly different to fit the kawaii image. Very well done! I think she definitely outclasses Kyary, and that Kyary knows it too, hence the pouting/ angry looks in Gaga’s direction. But I do think this is something only Lady Gaga could pull off. It’s just too outrageous for anyone else to get away with.